Today I wanted to talk you about NCrunch, a great tool I´ve discovered thanks to my colleages in my new job. It allows us to automatically run our Unit Tests while we are writing the production code. 1) Start with a failing test (don´t fail to fail!). This test checks a small working piece of functionality. 2) We write the minimun amount of code that makes it pass. Minimun is minimun! 3) Refactor the code (tests and production code) to avoid duplicated code and do improvements. We iterate though every of these steps, adding more and more tests until we have all of the user story finished. Previous tests must pass in every moment. You´ve probably noticed that a quite important part is running tests. I´m so used to watch the tests explorer (whatever it is) and run tests manually as I follow TDD. So here it comes NCrunch to give us a hand in this task. NCrunch is running on paralel, watching our changes, and running all of the tests again as soon as it finds any modification. There´s a circle in the corner of the right side. It will be green if every tests pass. Otherwise it goes red with a number, this tells the number of failing tests or projects that don´t compile. In the left side along the code, we see some arrows. These are starting tests. The arrow is green if it passes or red if the test breaks. In addition we can find code coverage in a very easy graphical fashion. If you see, we have some circles in colour. This circles are green if that line of code is succesfully reached by a test, likewise it goes red if the test doesn´t pass. Circle becomes black when the line is not covered at all. You can imagine how this helps doing TDD: we write a test and it goes red inmediately. We implement the minimun code (Resharper can help us doing that from the test). It will be the minimun, otherwise we´ll see black circles appearing in the logic. Test goes green and we do refactor having the test still green, together with other previous tests. It´s just amazing how you forget about Tests Explorer. When I started in my new job I noticed my colleagues hardly ever debug the code, and the reason for that was easy: NCrunch was doing the hard work for them. They code simply focusing on the programming part. NCrunch can be used with MSpec, Specflow, MSTests, NUnit and probably many others. NCrunch is just another productivy tool (yes, Resharper is the big boy). I know I have a few friends that don´t like to polute their wonderful Visual Studio environment, arguing mainly because it makes VS slower. As a side note, I would like to talk you something very funny that happened to me regarding NCrunch. In order to get the position I got in my new company, I need to do a programming exercise. I finished it and I was proud of the result. I followed TDD and so, my code coverage ought to be great. 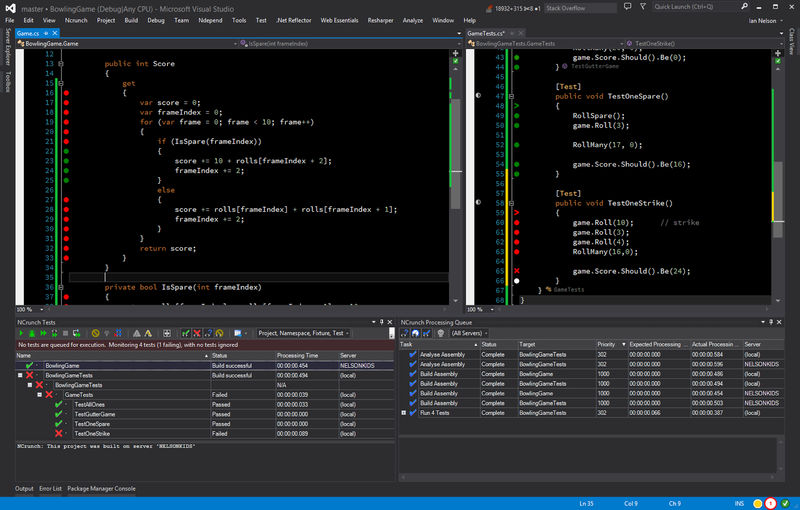 A couple of days after I started the new job, I opened my exercise solution with my brand new Visual Studio and NCrunch installed. Suddenly I noticed an entire method full of black circles, that wasn´t covered at all... Luckily my technical leader, Richard, was so kind to let me start working with them. Thankyou for sharing this code, its will be very helpful for us, i have also some useful information about scheme, affordable housing scheme . The Bella's are back, and they are better than ever. After being humiliated infront of none other than the President of the United States of America, the Bella's are taken out of the Aca-Circuit. ame Of Thrones season 5 Episode 4 plot|summary The fourth episode of the fifth season of HBOs television series Game of Thrones i.e. “Sons of the Harpy” aired on May3,2015 and was written by Dave Hill and directed by Mark Mylod. The episode revealed that Cersei Lannister meets with the High Sparrow authorizing the Faith Militant’s revival which caused one of the Petyr Baelish’s brothels and Ser Loras Tyrell is arrested due to his homosexuality. Stannis Baratheon told his daughter, Shireen the story of how she got afflicted with greyscale and how he did everything in his control to cure her. Sansa lighted candle for her deceased family members.